A special introduction to MOR sausages and a banging keto hot dog substitute idea perfect for BBQ season! So, first things first: Prick with a fork, or don't? I used to be in the first team but after learning that being a 'non-pricker' that all the fat remains in the sausage causing them to be the juicy, succulent tasty sausages they are meant to be; pricking them is like draining a paddling pool before getting in and then wondering why it's dry. Secondly, have you ever eaten a sausage that has beetroot inside? Or that is so full of vegetables and other fun like lentils that it's a vibrant green colour, as opposed to the standard grey? 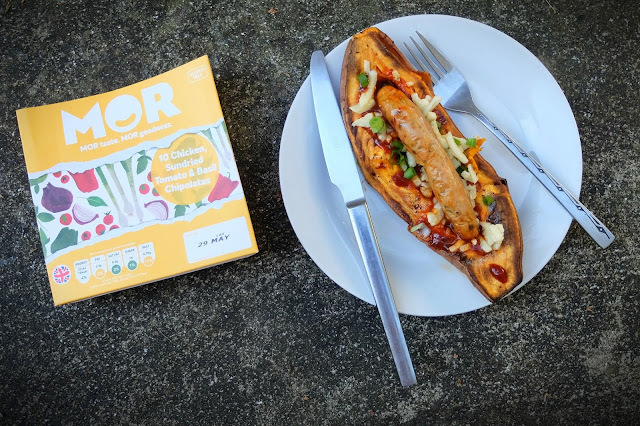 Mor sausages leapt onto the scene this year with an array of unique flavour combinations that have been cleverly put together to deliver some very appealing packs of pork. They were so good that me and my best friend ate 18 sausages between us over the course of two days. We aren't big. We just loved them! The first ones we tried were the 'Pork, Super Green Veg & Lentil' green ones, I was most excited to open those over the rest because of their uniqueness - a green sausage! Come on! It's awesome! Made with asparagus, peas, spinach, green lentils, onion and coriander with a sweet chilli dressing - loads of flavour and loads of fibre yet they have the firm texture of a meaty sausage - not uncommon with a mushy veggie 'bean' sausage or something. Now you might be thinking 'ahh she would say that if she's getting free food sent to her' But trust me, please. I only advertise products which I genuinely believe are worthy of the hype. I am an honest person who values integrity. That's why you don't see product after product on this website or review after review. Only the best make it! which are skinnier than the rest. Fun to have a chicken sausage, hey! 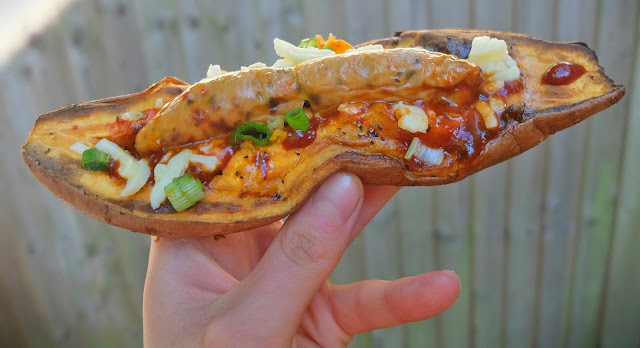 And if you're on the keto or paleo diet and are facing BBQ season wondering how you can get involved in hot dogs and burgers, the sweet potato is your friend. If you bake it until it's nice and squidgy, you can just press your sausage into it, like it's going to bed for the night and surround it with lots of bedtime favourites to help him sleep - like cheese and onion and hot sauce and butter. Are you with me? This also works for burgers. Just cut the sweet potato (make sure it's a massive one) width ways into rings and bake on a low heat until soft and then butter them and use them as the bun for your burger and stack as you would a normal burger, with cheese, relish and the like. Scatter with cheese, onions and hot sauce and season!